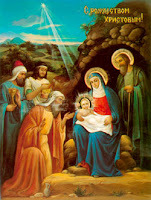 Russian Video: Orthodox Chrismas.Address of Patriarch Kirill. The head of Russian Orthodox Church, Patriarch Kirill, held a Christmas speech to the flock after the end of the celebratory service in Russia’s main Cathedral, Christ the Savior in Moscow. Next: let’s watch a video about some Russian traditions of celebrating Orthodox Christmas in Russia. This entry was posted in Religion, Traditions on January 7, 2010 by admin.